First, open the simulator on the product page. 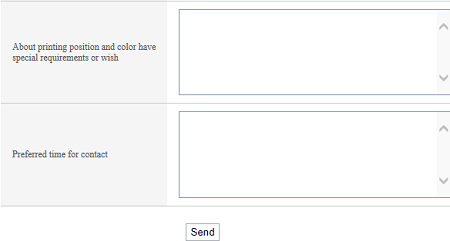 Choose a shirt style and a shorts style and select the color for each part while checking your design on the screen. You can simulate a team name and player name as well as emblem patterns and more. When you have settled on a design, please make an inquiry. After consulting with you, a staff member will create design data based on the design you created with the simulator. If you have any requests for design corrections, changes, or the like, then please inform our staff member at that time. 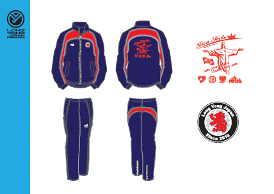 When your design has been finished, we will provide the order form. 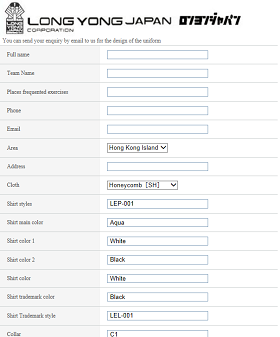 Enter your team members' sizes, quantities, numbers, and player names into the order form, select your desired payment method, and transmit it to us. 4. After order placement and payment, we manufacture at our own factory. After your order is placed and we confirm your payment, we begin the manufacturing process at our own factory. After confirming your payment of the remaining balance, we will deliver the finished product. Delivery occurs within approximately three weeks after you place your order. You are welcomed to contact our Design Support Team for your design discussion! Enter the required information into the inquiry form for each product and transmit it to us. We will check the information, and a staff member will then contact you later. We will perform a consultation with you and create design data based on the information you entered into the inquiry form. 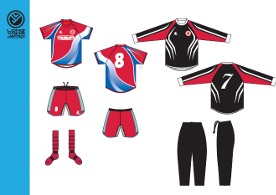 When your design has been finalized, we will provide the order form, Enter your team members' sizes, quantities, numbers, and player names into the order form, select your desired payment method, and transfer it to us. After your order is placed arid we confirm your payment, we begin the manufacturing process at our own factory. Please make sure to read this information before making your purchase. Please fill n the order form. Includes information on how to make a payment for your purchase. Order will be placed once banks payment is ready and completed. 30% paid five days before arrival. 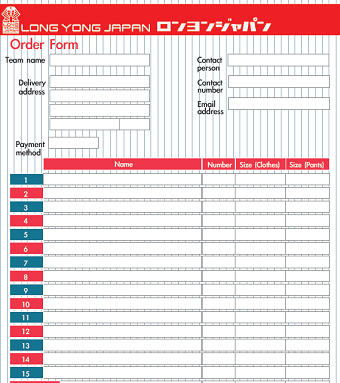 Please email or fax the receipt and your order reference number to us, after the payment is made. If the payment is made online, please add your order reference number in the "Reference" field. Note: The order reference number is provided in the order confirmation email. Includes Information on delivery methods and postage charges for your purchase.